"Inspired by the kings of swing: Frank Sinatra, Dean Martin and Sammy Davis Jnr, The Tap Pack are bringing a new, exhilarating energy to a timeless style. With slick suits, sharp wit and songs from Sinatra to Ed Sheeran, Australia's finest tap dancing performers are a cocktail of pure entertainment. 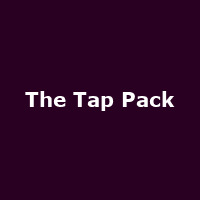 The Tap Pack and their four-piece live band serve up classics with a twist, infused with world-class tap dance."